Lots of infantry, not many vehicles. I ran across the problem that I only packed one damned rhino! I also had NO idea what the regular crowd was going to be bringing. Game 1 I played against a Mechdar force with allied in Knight titan. Imperial Knight+Wraithknight+him seizing+BONEHEAD deployment decision=humiliating defeat. Was tabled turn 5, managed to drop titan. My dice rolls were pretty horrendous, but really the biggest thing is that I forgot that Huron had a S6 armor bane weapon. When I remembered and closed in with him, I finished it off. Had I done this early, the game may have gone differently. Game 2 I played a Tau player. It was a KP mission and he eked out a win on the tertiary objective with us tying for all others. The oblits ruled the day here as they claimed nearly 7 alone. Well fought, especially because the mission rewarded him +2 to start because I had no FA. Overall, a bloodbath. He ran a dual riptide list with a Farsight enclave primary force with allied tau, 4 tetras, missile riptides, and a metric ton of fusion blasters. Game 3 I played against 1850 points of guard. An AMAZING army, all metal old Praetorians. 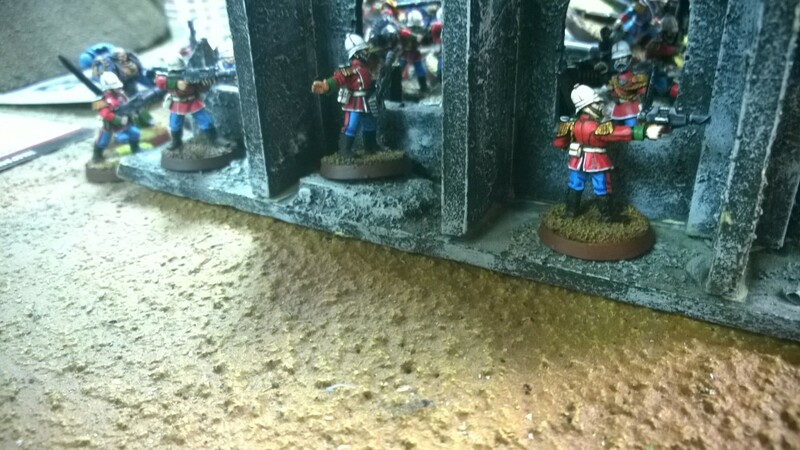 A HUGE amount of infantry, the game was relic and hammer and anvil…ie- NOT GOOD FOR A FOOTSLOGGING ARMY! The oblits outflanked very late and hit one blob with heavy flamers, then twin-linked flamers…then failed a 2″ charge through difficult terrain. We pounded the crap out of each other, probably killing 50 guardsmen, but to no avail and the game ended in a loss with him taking a win because of the tertiary (killing the most psykers)…because my psyker perils of the warped himself to death…so basically, I literally gave him the win. Other than that, he would have tied exactly. He had first blood, I had linebreaker. I apologize for the crappy quality of the pics. It was an amazing army. But overall, I had a blast. They are a really fun group, and I look forward to hopefully getting to go this Wednesday. Overall, the store is amazing, the group is fun and very open to new players, and the skill level goes from beginner/novice to veteran/ATC champions. Hope to cover the store on a separate entry with some of the amazing staff there. They are knowledgeable and openly offer advice on lists and how to build and shape a better one without just simply saying a list should be scrapped for a netlist/cheese list. If you are in VA, it’s a must to visit for 40k players!